Statement is a two-way compact loudspeaker equipped with PA loudspeakers and can therefore generate very high levels. 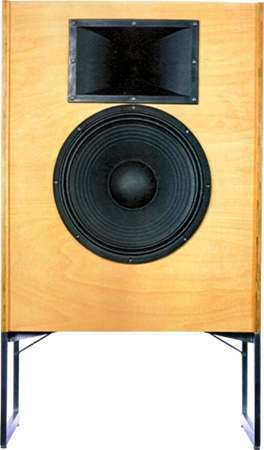 Statement is a bass-reflex cabinet loudspeaker with drivers of Monacor and Celestion. The loudspeaker has been developed by Bernd Timmermanns and Philipp Busch. - a 2nd order low-pass filter (12 dB per octave slope) for the woofer to which an LC circuit is connected in series. The frequency response of the speaker is balanced. The decay spectrum is practically faultless. The non-linear distortions remain at 90 dB (1m) above 50 Hz almost consistently below 1.5%. The high-end kit is delivered with baked varnish and vakuum impregnated coils on important parts of the crossover for minimizing microphonic effects. - The current flow through the coil creates a magnetic field which sets the reel of wire in motion. This motion induces a voltage in the coil which adds itself to the signal. The stiffer the reel of wire is, the less the signal will be altered. The capacitors for the tweeter are of type polypropylen (MKP) Rike oil paper S-Cap with 630 V.
The impedance correction is suitable for amplifiers up to max. 40 watt.